Introducing the The Naked Tiger Hostel's in-house surf company Naked Surf. We run daily shuttles to the surrounding beaches of San Juan Del Sur and beyond. Naked Surf takes into consideration the optimum surf conditions for our guests and clients. Surfing or sunbathing we provide an experience that suits all our customers. We have: Longboards, MiniMals, Funboards, Fish and Shortboards. 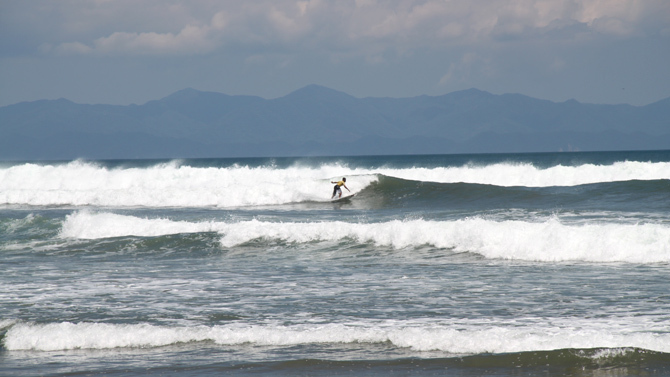 We provide you with a surf lesson designed to suit you and your experience in the water. Price of lessons includes 1 & half hour lesson, price of travel and surf board. San Juan Del Sur has some of the most beautiful and best surfing beaches in the whole of Central America and the world. Here is a review of the beaches our excursions visit daily. Remanso is a great beach for beginners to intermediate levels of surfers. It's a consistent beach break that holds well. Remanso can get huge in a big swell. This is a mostly rocky beach that has a nice atmosphere with food and drinks available. Playa Maderas is one of Nicaragua's most popular surf spots due to it's consistency and hollow powerful beach break. It is one of the prettier beaches in the area and has an established restaurant with good food. Maderas is a beach enjoyed by surfers and beach lovers alike. Playa Hermosa is another favorite destination for Naked Surf. This is a beautiful, long beach that has twice hosted the tv show Survivor. This deserted beach break has long rights and lefts and is perfect for all levels of surfers. Food, drinks and showers and massages are available at this beach.